Keeping a healthy, organized, clean, home. Happy Saturday to you all! It’s supposed to be a hot one today so we’re hoping to find something to do that is nice and cool. I just returned from a nice 11 mile run. The hubby took off for his right after I returned. Unfortunately his run is going to be much hotter than mine was but he doesnt’ mind the heat as much. We only have one more long practice run before our half marathon in a few weeks. The weekend before we are running the Color Run which I’ve heard is a really fun race. This morning before my run, I started with two cups of coffee with almond milk and stevia. The usual. Then I had a banana with some almond sunflower seed butter as well as a large glass of water. I always try to get a little something in my stomach before a run. When I run, I have to drink water throughout. So I take along my running water bottle the hubby got me a few years back. I would DIE without it! I filled it with Smart water to replace electrolytes I lost while sweating. When I returned, I was famished and a good 3 pounds lighter than when I left. I’m telling you, my body retains so much water it’s crazy! And, I sweat buckets so I lose a ton of electrolytes while running. I’ve had a doctor tell me this is why my blood pressure is so low. (just the other day at the doc it was 85/55, crazy!) So after stretching and showering off the salt crusted to my body, I blended up a Pina Colada Green Smoothie with O.N.E Coconut water. I like coconut water in this particular smoothie so much more than milk. I used half a fresh banana in my smoothie and ate the other half with all natural peanut butter while my smoothie was blending. Like I said, I was famished! On top of that I downed another full Smart Water. So full of liquids right now. 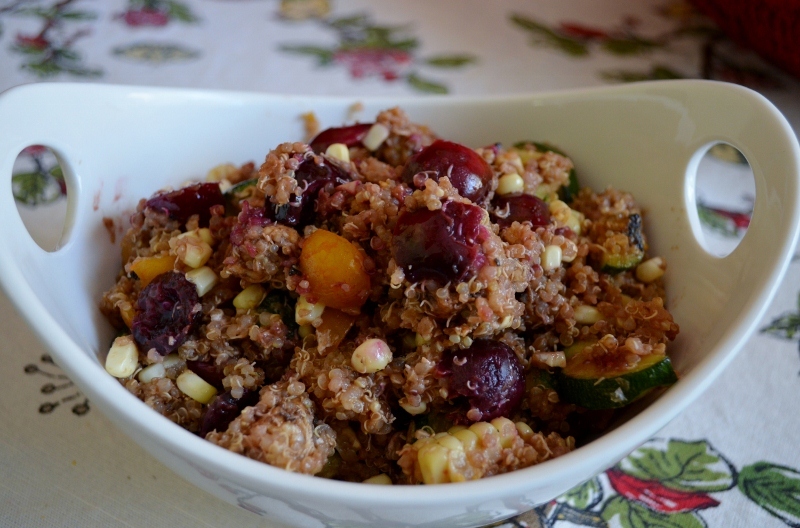 Then I made a quick quinoa salad for a bbq tonight at . I bought a few bags of cherries this week since they are on sale at almost every grocery store right now. The Love Nugget really likes them but who doesn’t? Last night we had bbq chicken kabobs with grilled peaches and zucchini with a balsamic reduction sauce. We grilled extra chicken, corn and had left over sauce so I figured I’d use it today in my quinoa salad. This is what I came up with. Rinse quinoa then put it in a sauce pan with the 2 cups of water. Bring to a boil then reduce heat, cover and cook for about 10 minutes. Set aside to cool. Either grill the zucchini on an outdoor grill or if you have a grill pan you can use that. The grill pan will work better for the cherries which is what I used. I also used my handy cherry pitter to remove the pits from all the cherries. Love that thing! Grill the cherries for just a few minutes stirring once or twice until softened. 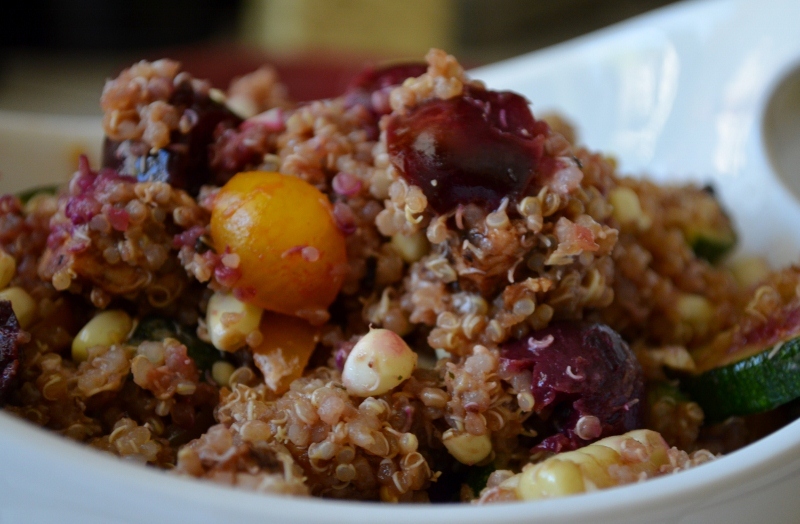 Combine the quinoa with the rest of the ingredients and chill in the fridge until serving. Yum! I like to find new ways to add fruit to savory dishes and this turned out really good. Hopefully it’s a hit tonight! I'm a stay at home mom to my little Love Nugget and wife to my wonderful hubby. 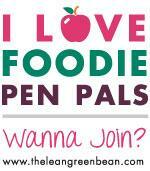 I love eating healthy, working out and keeping my household healthy and happy!